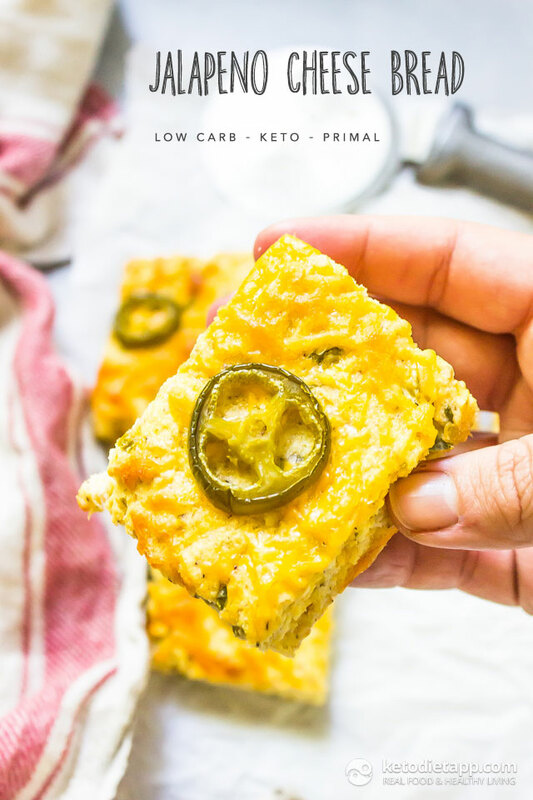 This keto jalapeño cheese bread is reminiscent of pizza bread! 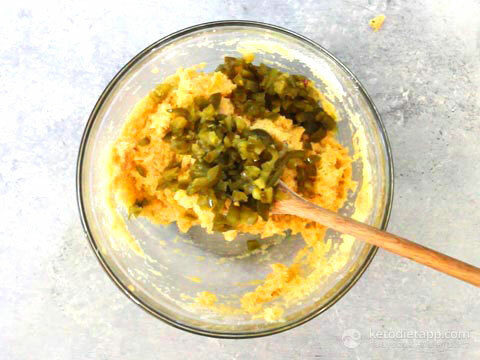 Only requiring one bowl this is an easy low-carb, nut-free bread option to whip up for sandwiches, a snack, or simply a side. 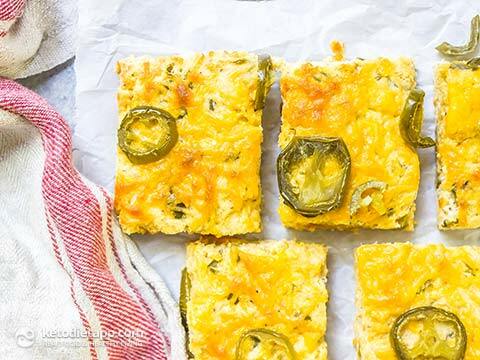 Don’t like jalapeños or making this for the kiddos? Simply leave off the jalapeños or swap them for pepperoni or any other pizza style topping of your choice. This bread is also great when dunked into a bit of marinara or ranch dressing. Preheat the oven to 190 °C/ 375 °F and line a baking sheet with parchment paper. 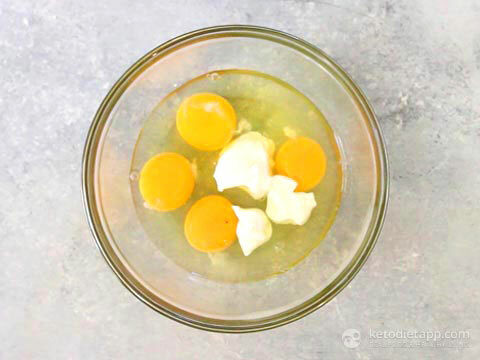 In a medium bowl whisk together the eggs and Greek yogurt. Add coconut flour, psyllium husks, salt and baking powder. 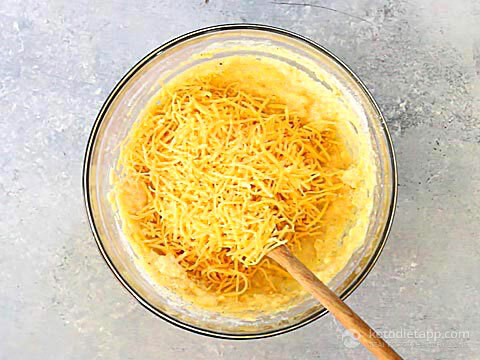 Once smooth stir in half of the shredded cheddar cheese. 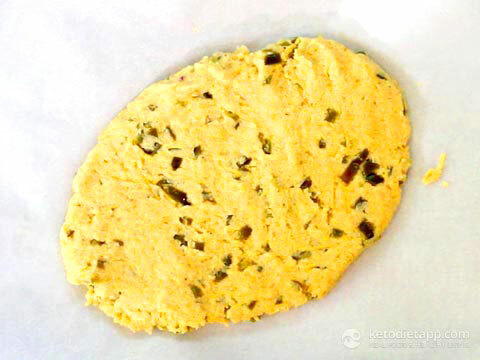 Press the dough into a 2.5 cm/ 1 inch sphere on the baking sheet. 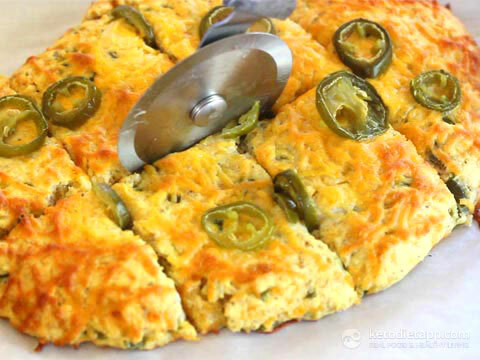 Top with remaining cheese and additional jalapeños if desired. Bake for 15 minutes or until golden and fluffy. Cut into 8 squares. Serve warm or let it cool down. Store in an airtight container in the refrigerator for up to 7 days. This bread is beyond Delish. I made a batch less than an hour ago so I would have it ready thru the week and my family inhaled it. Batch 2 happening now. Thank you Sandy, I'm glad you enjoyed! why do you need the Psylium husks in this receipt?? Hi Sure, psyllium powder is a great ingredient for keto bread recipes as it makes them fluffy and also improves the texture (they hold better together). I use it in most bread recipes: Ultimate Keto Buns I hope this helps! Hi, can I use Xanthum Gum instead of the Psyllium? and if so how much Xanthum, please. I have a serious allergy to psyllium. Hi Leslie, I don't usually use xanthan gum but I'd guess that 1/2 teaspoon should be enough. 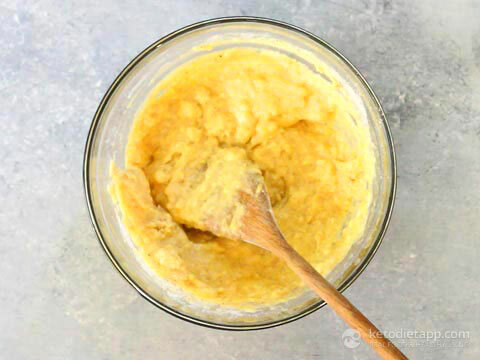 You may need to add 1-2 tablespoons of coconut flour or flax meal just to make up for the missing psyllium. Is there something to substitute for the yogurt? Thank you. Sour cream or cream cheese (room temperature so it's easy to mix) will work instead of yogurt. This looks great. Going to try tomorrow, will report back. My question is can you freeze some of this "dough", or have you tried? I'd like to make a double batch and use some down the road just to make it easier for time and clean up. Can I substitute psyllium husk powder for the whole psyllium husks? I think that should work, at least it is what I use in other bread recipes. I would just use less, only 1 tablespoon. Can’t wait to try this. 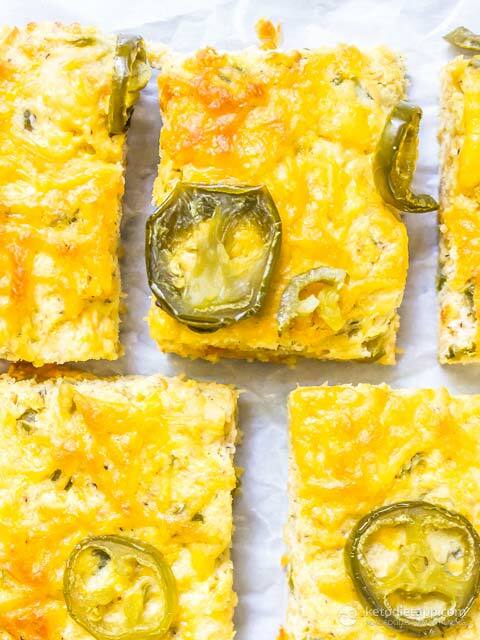 Can you use fresh jalapeños instead of pickled? Thanks!